CMP Clean-up Counters are high quality stainless steel tables, counter, and sink units. Our Clean-up Counters have been designed for the functional requirements of the hospital operating room and emergency room. CMP Clean-up Counters have evolved into the industry standard for this application. 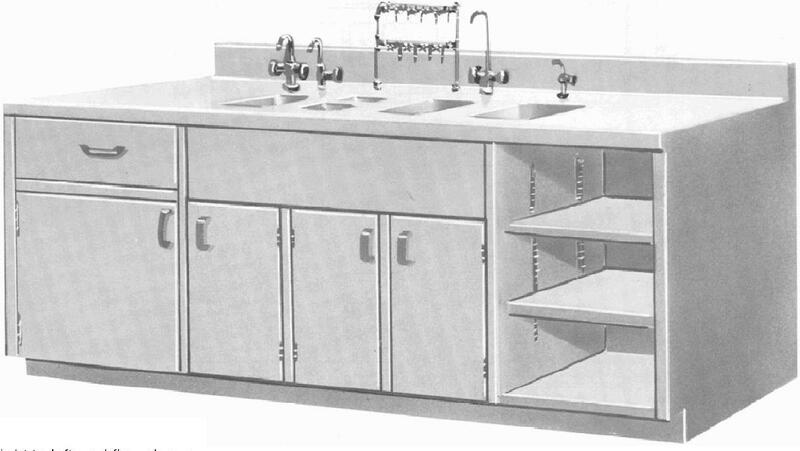 CMP has been building high quality stainless steel Clean-up Counters for over 65 years. CMP products can be found in almost every hospital in the U.S. and worldwide. Clean-up counters can be configured for your unique requirements. Contact us for more information at sales@continentalmetal.com . CMP Clean-up Counters are completely inter-piped and inter-wired, requiring only one single connection for each service. Required service connections are ¼” I.P.S. hot water supply, ¼” cold water supply, ¼” distilled water supply; ½” air; 1½“ waste. CMP Model CU-126 Clean-up Counters are constructed with 126” (3200 mm) x 29” (737 mm) x 40” (1016 mm) type 304 stainless steel with No. 4 finish. CMP Clean-up Counters have a top working surface provided at a height of 36” (914 mm). The Top is constructed of No. 16 gauge (1.5 mm) stainless steel with integral 4” (102 mm) high backsplash and include five cove-cornered sink bowls with strainer drains and chrome-plated gooseneck faucets for distilled and hot and cold water. The Clean-up Counter also includes an air valve with 72” (1,829 mm) hose and chrome-plated tube washer with combination faucet, vacuum breaker and eight valved outlets. The base cabinet is 24” (610 mm) wide x 27” (686 mm) deep and contains 5” (127 mm) deep removable, stainless steel drawers mounted on ball bearing slides, and bottom and intermediate shelves concealed with hinged double-pan doors. The middle portion of the unit is 66” (1,676 mm) wide and includes a bottom shelf and two adjustable intermediate shelves. The bottom of the Clean-up Counter has a 4” x 3” recessed toe space.